In pursuance of the provisions of the Local Government Act, 1993 and the Regulations thereunder, notice is hereby given that a POLICY REVIEW COMMITTEE MEETING of Penrith City Council is to be held in the Passadena Room, Civic Centre, 601 High Street, Penrith on Monday 22 May 2006 at 7:00PM. Policy Review Committee Meeting - 20 March 2006. His Worship the Mayor Councillor John Thain, Councillors Jim Aitken OAM, Kaylene Allison, David Bradbury (arrived 8:30PM), Kevin Crameri OAM, Ross Fowler, Jackie Greenow, Susan Page and Pat Sheehy AM. 12 RESOLVED on the MOTION of Councillor Pat Sheehy seconded Councillor Ross Fowler that apologies be received and accepted from Councillors David Bradbury, Lexie Cettolin, Greg Davies, Mark Davies, Karen McKeown and Steve Simat. Leave of Absence was previously granted to Councillor Rumble for the period 13 March 2006 to 29 March 2006 inclusive. 13 RESOLVED on the MOTION of Councillor Ross Fowler seconded Councillor Kevin Crameri that the minutes of the Policy Review Committee Meeting of 27 February 2006 be confirmed. A five (5) minute break was taken at the conclusion of the Director – City Planning’s presentation on The City as a Social Place – Planning Issues, the time being 8:05PM. The meeting resumed at 8:10PM. 3. Council staff be congratulated on their commitment to the achievement of the 2005-2009 Strategic Program. There being no further business the Chairperson declared the meeting closed the time being 9:56PM. To advise Council of the outcomes of the Penrith Valley Cultural Precinct Steering Committee Meeting. The report recommends that the information be received. The development of the Penrith Valley Cultural Precinct at St Marys is a major project and has an implementation program over an extended period. There have been two (2) comprehensive studies undertaken by specialists engaged by Council. In particular, the Woods Bagot report included a Precinct Masterplan which Council subsequently endorsed. That Masterplan has been adopted as a guide for Council’s implementation strategy. Major Civil Infrastructure works were completed about 18 months ago as Stage 1 of the masterplan implementation. · Develop a Precinct Business Plan. Council was presented with an information report at its meeting on 12 December 2005. · CWA building – Detailed documentation is nearing completion which will facilitate lodgement of the development application, the calling of tenders and selection of a preferred builder. That will occur over the coming months. This building has been identified as an area that will be occupied by community groups that require “wet areas”. Council officers have interviewed such groups and established their detailed needs. This information has been forwarded to the architect for inclusion in the documentation. · Memorial Hall – A detailed brief has been completed and expressions of interest are being sought from suitably qualified and experienced architects to undertake a scope of work. A report was be presented to Council on 24 April 2006 recommending a short list of preferred architects. · Former Council Chambers building – This building is identified as an item of heritage significance. It is necessary that a Conservation Management Plan be prepared and appropriate specialists are currently being sought to undertake that work. · Accommodation Needs – The initial findings from the Elton study have been received by Council officers and appropriate information forwarded to the architects. It was explained to the Committee that one interesting fact that has emerged from this work and other enquiries that Council officers have completed, is that not all the current city-wide community/cultural groups will be accommodated in the Precinct. · New Child Care Facility – This facility has a low priority and as such work on the completion of the consultant brief is being advanced accordingly. · Property Acquisition – The Property Development Manager is pursuing acquisition of the remaining Swanston Street property. Negotiations are proving successful. Council at its meeting of 6 March 2006 authorised the demolition of No. 11 Collins Street, St Marys. · Precinct Management – Discussions are continuing with representatives of the interim Management Committee. A discussion paper is being prepared for the Committee’s next meeting which addresses options for the future Precinct management model. · Funding Model – Financial Services Department staff have developed a new funding model. · Project Timetable – A revised timetable has been prepared by Council officers. Keeping everyone informed was another important matter raised by the Steering Committee. It was suggested that there be a quarterly newsletter prepared and distributed to relevant stakeholders. The financial model that was presented to the meeting was a “work in progress” document and Council officers will continue to develop it, focusing on identifying funding sources and costs to reflect the scope of work as it becomes clearer. The Council Officer Project Team will continue to address the above tasks. A further Steering Committee meeting is planned for early June following which a status report will be presented. That the information contained in the report on Penrith Valley Cultural Precinct be received. To propose interim development guidelines for the precincts covering the former Council Chambers site and the High St West area in advance of formal amendments to the new Penrith Development Control Plan. The report recommends the adoption of the interim development guidelines. Council, at its Ordinary Meeting of 10 October 2005, resolved to prepare a draft Development Control Plan (DCP) for the former Council Chambers site, in accordance with the Environmental Planning and Assessment Act 1979 and Regulations, 2000. The High Street West precinct guidelines have been prepared to provide a context in which to consider the development proposal (currently before Council) for a six storey mixed use development at 538-556 High Street. Since Council’s initial resolution, the Metropolitan Strategy has been released and Penrith has been designated a Regional City. The Premier and Minister for Planning have announced that new plans will be prepared by a Taskforce for the six regional city centres (Newcastle, Wollongong, Parramatta, Liverpool, Penrith and Gosford) by December 2006. The Minister for Planning has since written seeking Council’s commitment to work cooperatively as part of the Taskforce in developing the plan, which will include a vision, an appropriate planning instrument, a development control plan including design guidelines, a public domain plan and a contribution plan. The Minister has also indicated that he will ensure there is a whole of Government input into the planning process, and that real outcomes flow from the new city plans. Comprehensive controls for the City’s two Centres, including provisions for all precincts in the Penrith City Centre and St Marys Town Centre, will be prepared over the next 6 months. As the detailed planning controls for the Penrith City Centre will now be developed through the Taskforce process, it is proposed that the controls outlined in this report should be adopted as Interim Development Guidelines, to expedite matters pertaining to development proposals for the two precincts. The adopted Interim Guidelines will subsequently be incorporated into the plans prepared by the Taskforce, and then into the Penrith DCP in Stage 2 of the Local Plan process. The two precincts are subject to potential development proposals that could provide significant benefits to the future of Penrith as a Regional Centre. Draft controls were initially presented to a Councillor workshop on 19 April 2006, and are now attached for Council’s consideration. In response to Council’s resolution to prepare a draft Development Control Plan for the former Council Chambers Precinct, the NSW Government Architect’s Office (GAO) was engaged to prepare development provisions for the Precinct. At this stage the precinct encompasses only a narrow portion on the western boundary of the TAFE site to allow for the development of a laneway in this location to improve vehicular permeability between Belmore Street and Henry Street and to access car parking. Further discussions with TAFE are required prior to any detailed development controls being established for the site. · To acknowledge the site as a gateway precinct; development of which must have a high level of activity at the ground levels and incorporate high quality architectural designs. · The creation of a pedestrian thoroughfare and public square internal to the precinct. The proposed maximum 8-storey height represents a change from the 6 storeys proposed in the exhibited draft Penrith City Centre Strategy. This is the result of further site investigation and consideration. Upgrades to footpaths and lighting, and the provision of street tree planting, street furniture and public art will be required to contribute to the revitalisation of the Precinct, and the presentation of Penrith as a Regional City Centre. This will be addressed through the development of the Public Domain Plan. This precinct generally includes land bounded by High Street, Worth Street, Union Lane and Station Street. The proposed guidelines do not, at this stage, encompass the High Street / Station Street corner site, as further investigation is required of potential building heights and the impact on the viewshed to the Blue Mountains escarpment. Council is in receipt of a mixed-use development application (DA 03/3292) for 538-556 High Street, which originally proposed an eight-storey building. The application has been the subject of a number of reports to Council, lengthy discussions with Council staff, and the applicant has recently lodged amended plans that now propose a six-storey building. · Ensure active street frontages by requiring a minimum percentage of the frontage width to contain entrances, shop fronts, lobbies and cafes etc facing the street, and for these frontages to have a zero lot setback to High Street. The exhibited draft Strategy proposed a built form of up to five storeys for this precinct. The proposed maximum height in the guidelines can accommodate a six-storey building through a mix of ceiling heights for different uses. The proposed design controls require the setback of the upper floors. Clear direction on the form and functions of areas within the City Centre ensures that new development is responsive to the desired future character of the City. Strong themes emerging from the exhibition of the City Centres Strategies were ensuring that new development within the City improves the pedestrian environment, and increasing the number of residents living within the City Centres. The guidelines incorporate these objectives within their controls. The proposed draft Interim Development Guidelines are attached for consideration and are recommended for adoption. Adopting these guidelines will provide Council staff and developers with clear controls by which the future development of the precinct can be appropriately guided and managed. Strategic Program Term Achievement: Council continues to offer leadership in developing a better understanding of and cooperation with Aboriginal and Torres Strait Islander organisations and people. Critical Action: Undertake joint initiatives with Aboriginal and Torres Strait Islander organisations and people to increase understanding and cooperation. To inform Council of the protocols for the "Statement of Aboriginal and Torres Strait Islander Recognition" for Civic Receptions, Citizenship ceremonies, NAIDOC Week Civic occasions and Council Ordinary meetings. The report recommends that Council reconfirm its protocol as outlined in this report, and adopt the Policy on the Statement of Aboriginal and Torres Strait Islander Recognition, as shown in the appendix of the report. The Reconciliation movement in Australia in the 1990’s brought about a number of initiatives, activities and actions in an endeavour to progress a healing process between Aboriginal and non-Aboriginal people. The adoption and implementation of certain protocols was supported as part of this Reconciliation process. This included organised marches, establishing local community reconciliation groups, preparation and adoption of formal statements of Reconciliation, symbolic gestures such as permanently flying the Aboriginal Flag, formal statements of acknowledgement of Aboriginal original ownership of the lands and waters in respective areas and “Welcome To Country Ceremonies”. Aboriginal involvement, input and response to the whole of the reconciliation movement and indeed to the initiatives, activities and actions that came about as a result of this movement were diverse and broad ranging. These responses ranged from one of welcoming the process, to that of suspicion of the whole process and that no constructive outcomes for Aboriginal people would result. One of the factors for those with misgivings in relation to the reconciliation movement was that it was seen as a process undertaken at arms length from grass roots people, a process which was externally driven with lip service being paid to the notion of reconciliation by promoting a non-Indigenous concept. With respect to Council it is the expression of the latter abovementioned sentiment that Council needs to consider in its response to adopting protocols such as a “Welcome To Country Ceremony”. This aspect of supposed cultural expression is one that many Aboriginal people in the Penrith Local Government Area feel very strongly about and one that they have concern with. According to these Aboriginal people, the problem with this practice is that it is deemed to be superficial and belated - a ceremony which is considered hardly reasonable in that it welcomes non-Aboriginal people to lands of which Aboriginal people have been dispossessed, and which have been usurped by non-Aboriginal people. While at the same time clearly acknowledging the limitations of the reconciliation process outlined above, it is important to note that many Aboriginal people do understand that actions to pursue symbolic gestures which recognize Aboriginal people, their culture, and their original ownership of lands and waters are well-intentioned. Many Aboriginal people also understand that for some within the non-Aboriginal community it is a genuine expression of a way for them to make a contribution to address some of the injustices of past practices and policies. · Through its NAIDOC Week and other Civic Receptions clearly emphasising the importance of partnership and the recognition of the importance of Aboriginal and Torres Strait Islander self-determination. In some cases a shortened version of the full statement is used. An example of this is in the speech given by the Mayor at Citizenship Ceremonies. An important aspect of the adoption by Council of the above symbolic measures is that it was indeed Aboriginal people themselves who requested, sanctioned, accepted, agreed and supported the actions undertaken by Council. Importantly it is invariably Council’s leader, the Mayor that expresses the Statement of Recognition. The Mayor is the elected leader of the City and when the Mayor expresses the Recognition Statement Aboriginal people, who are also constituents of the City, can see the civic leadership provided by the Mayor. At the same time Council, through the Mayor, is also demonstrating its leadership to the broader community on matters of importance to Aboriginal people. Symbolic gestures do have their place, and indeed as a result of Council’s resolutions to acknowledge and implement certain protocols, there has been a noticeable improvement in relationships between Aboriginal people and Council. However while the practice of some symbolic gestures are welcomed, for Aboriginal people the overuse of such platitudes can sometimes become more and more exaggerated and far removed from what they themselves deem as an appropriate way for cultural expression. Initiatives, activities and actions to progress a healing process between Aboriginal and non-Aboriginal people should not be confined to measures which are principally symbolic. In reality this confinement delivers very little in response to Aboriginal concerns, needs, aspirations for self-determination, and economic, social and political justice for Aboriginal people. Council has been mindful of this aspect and have therefore initiated innovative approaches with Aboriginal input and participation. · Auspicing the Indigenous Homelessness Project on the request of a number of Aboriginal partner organisations. The delivery of tangible and practical outcomes for Aboriginal people that have a local focus and are based on the principles of partnership and Aboriginal self-determination contribute enormously to meaningful and sustainable reconciliation. Penrith City Council’s approach in its implementation of certain Aboriginal protocols was undertaken in the spirit of reconciliation. This approach has been supported, recognised and received positively by Aboriginal people. Furthermore, it has sent a message to both Aboriginal people as well as the broader community that Council is committed to pursue and establish meaningful working relationships with Aboriginal organisations and residents in the Penrith Local Government Area. In its evolving partnership relationship with Aboriginal organisations and people, Council has also moved beyond symbolic gestures and developed positive initiatives with its Aboriginal partners to respond to issues of social, economic and political justice. 1. The information contained in the report on the Aboriginal Protocol for Penrith City Council be received. 2. Council reconfirm its current Aboriginal Protocol for Civic Receptions, Citizenship ceremonies, NAIDOC Week civic occasions, and Ordinary Council meetings as outlined in this report. 3. Council formally adopt the Policy on the Statement of Aboriginal and Torres Strait Islander Recognition as shown in Attachment 2 to this report on Aboriginal Protocol for Penrith City Council. We work together for a united Australia and City that respects this land of ours, that values the Aboriginal and Torres Strait Islander cultural heritage, and provides justice and equity for all. In developing Aboriginal protocols Council has adopted a Statement of Recognition protocol. The emphasis placed on symbolic gestures must be balanced with partnership initiatives that respond to the concerns, needs and aspirations of Aboriginal people for self-determination, and economic, social and political justice. Council’s partnerships with Aboriginal organisations are based on these imperatives. The Statement of Recognition documented below is to be expressed by the Mayor (or his/her nominee) at Ordinary Meetings of Council and Civic Receptions. For other occasions it may also be included in opening public events or launching public initiatives. “Council values the unique status of Aboriginal people as the original owners and custodians of lands and waters, including the land and waters of Penrith City. To advise Council of the outcomes of the Working Party meeting and progress being made towards the integration of the City's principal cultural facilities. The report recommends that the information be received. · The need for stakeholder consultation. The Working Party then met on two (2) subsequent occasions to advance the program following which Council was presented with a status report at its meeting on 6 February 2006. The Working Party’s has met again on 8 March 2006 and 12 April 2006, to review progress. With respect to the service specification, a specialist has been engaged by Council to assist in the preparation of the necessary documents. Workshops have been held with participation by both Boards’ representatives and relevant staff. The outcomes have been a draft service specification and a very positive attitude from the participants. Another important element of the process was the stakeholder consultation forum held on 6 April 2006. Invitations were forwarded to targeted groups in addition to a general invitation via the Mayoral message and press release. A timeframe was endorsed by the Working Party at its initial meeting. That has been revised by Council officers to accommodate some ‘slippage’. An amended timeframe was accepted by the Working Party. The overall program is still on target for completion mid year. The Working Party has reviewed the previously endorsed draft structure for this new entity and has added an additional Advisory Committee focusing on the ‘Conservatorium of Music’. The composition of the proposed new Board was also amended to reflect recent structural changes at the NSW government level. Recruitment of the new Board membership has been considered by the Working Party. Council’s Legal Officer prepared a Practice Note to address this matter, the details of which were endorsed by the Working Party. The Chairman of the JSPAC Board updated the Working Party on the progress made regarding the ‘merger’ of Railway Street Theatre Company with the JSPAC. Council at its meeting on 15 May 2006 considered a report on the outcomes of the last two (2) Working Party meetings and endorsed a series of actions. Council officers will continue to address the action steps endorsed by Council which are important in the achievement of Council’s Strategic Program. To advise Council of the outcome of the Councillor Working Party Meeting. The report recommends that the information be received and Council endorse the agreed program of activities. The Castlereagh site was reserved for cemetery purposes in 1903. Penrith City Council became Trustee of this site in 1995. Initial interest in developing the site began with the Cemetery Operations Working Party in 1995. Since that time a number of studies have been carried out including flora and fauna and viability studies. Development concept plans have been prepared and a Business Plan developed. Council at its meeting of 31 October 2005 agreed to the formation of a Councillor Working Party. Councillor Sheehy was elected chairperson. The Terms of Reference “to develop and report back to Council on a plan for the development of the Castlereagh Cemetery and Crematorium, and to oversee implementation of the plan as adopted by Council” were accepted by the Working Party. John Desmond of Desmond & Associates who was engaged to prepare the Business Plan spoke on the attractiveness and uniqueness of the site that would provide a distinctive bushland service and would be particularly appealing to the ‘baby boomer’ market. The site is also situated in an area of growing long term demand. It is also envisaged that cremation will be the predominant funeral service. He then described the structure of the funeral industry in Sydney and the competition. Mr Desmond advised that two areas that will need to be addressed are parking and security of the site. Risk factors include capital and running costs, changes in demand, environmental constraints, competitor’s reaction and importantly local resident reaction. There will need to be transparent public liaison with the community. The project could be publicly funded and operated, privately funded and operated or there could be a public/private partnership. Mr Desmond stated that it would probably be much easier if Council had total control of the project. The Senior Financial Accountant spoke on the preliminary forecast and the possible options of a fully funded external debt proposal or funding through the existing Cemeteries Reserve with a year four positive cash flow. It was agreed that from the investigations to date, the project is financially viable and should proceed. · The project be developed to Development Application stage. · Project costs refined and a budget provided. · Enquiries to be made (with the Department of Lands) regarding the terms of Council’s Trusteeship, particularly if a Board is set up to manage the cemetery/crematorium on the site. · Hawkesbury City Council be advised of the project and invited to discuss a possible partnership. · A community engagement strategy (drawing on Council’s policy) developed. · A project timetable prepared. · A project timetable is being developed, including options for engagement of design and architectural services. · Work continues on refining capital and recurrent cost elements detailed in the Business Plan. A revised cost plan will be put to the next meeting. · The trust management arrangements for the site have been clarified with the Department of Lands. Council is not restricted to a Trust Board, and is able to consider a full range of management arrangements. · The community engagement program has been completed for consideration at the next Working Party meeting. The project webpage is being developed as an extension of the current Penrith Valley Cemeteries website. · Preliminary traffic counts have been taken in Church Street and will be used as a basis of detailed examination of traffic management issues. · Advice has been sought from the Rural Fire Service regarding implications of the site being classified as bushfire prone land. Council officers will now move forward on these outcomes. Further Working Party Meetings are planned over the coming months. Strategic Program Term Achievement: Strategies are in place for new release areas to deliver jobs that match incoming workforce participant numbers. Critical Action: Work in partnership with the development sector to formulate and implement tailored employment strategies that are commensurate with the rate of housing development in new release areas. To inform Council of a request to amend the zoning provisions of Penrith Local Environmental Plan 1998 (Lakes Environs) to broaden the employment opportunities along the Andrews Road frontage of the site. A presentation will be made by Stockland on their proposal. The report recommends that the information be received. Waterside (Penrith Lakes Environs) is an urban release area adjacent to the suburb of Cranebrook. The site is generally bounded by Andrews Road to the south, Cranebrook Road to the west, Nepean Street to the north and Laycock Street/Greygums Reserve to the east. Planning for the estate was initially undertaken in the mid 1990’s and evolved in response to a multitude of on-site and surrounding physical characteristics, in particular flooding and industrial noise impacts. These investigations culminated in the gazettal of Penrith Local Environmental Plan 1998 (Lakes Environs) and the adoption of Penrith Development Control Plan 1998 (Lakes Environs) on 13 March 1998. The site comprises 2 development zones, namely the Residential (Waterways) 2(g) and the Residential (Services) 2(h) zones. A zoning map is appended to the report. The Residential (Waterways) 2(g) comprises some 53.3ha of land and is currently being developed by Stockland for housing, ultimately delivering some 694 dwellings. The Residential (Services) 2(h) zone is located along the Andrews Road frontage of the property. A principal aim of the Residential (Services) 2(h) zone is to provide employment opportunities within a quality built form that acts as an acoustic, physical and visual buffer between residential development on the site and industrial development to the south on the opposite side of Andrews Road. The current Planning provisions enable development of the employment land for a limited range of uses considered to be compatible with residential development and include visitor accommodation, health care services, business service activities, recreation facilities, warehouse/distribution centres and high technology industries. Development of the Residential (Services) 2(h) zone is required prior to the delivery of housing in Stages 5 to 9 of the Waterside residential estate, some 450 dwellings, a significant portion of which are multi-unit housing. Stockland has sought ‘expressions of interest’ from the market to develop the Residential (Services) 2(h) zone. They advise that process has identified limited interest in developing the site for the current range of permissible uses, leading to the contention that development of the site would not be commercially viable under the current zoning. Stockland argue that the range of uses permitted within the Residential (Services) 2(h) zone is limited and needs to be expanded to ensure the timely delivery of housing on the site and make Waterside a vibrant, socially and economically sustainable community. We have been discussing this issue with Stockland who have expressed the desire to present their proposal for development of the Residential (Services) 2(h) to Councillors. It should be noted that Stockland has submitted a pre-rezoning proposal and intend to lodge a formal rezoning request following this meeting. · Expand the range of uses permissible within the Residential (Services) 2(h) zone to include Car Washes, Fast Food Take-Away Restaurants, Hotels, Housing for Seniors or People with a Disability, Light Industries, Motor Showrooms, Office Premises (max of 1,000m2 of gross floor area across the entire site, excluding ancillary office space associated with other permissible uses), Service Stations, Shops, Warehousing with ancillary shop (max 100m2 of gross floor area for shop). The 2(h) zone is proposed to be developed in six precincts to accommodate the above uses. Those precincts are shown on the map at Appendix 2 and the proposed land uses are outlined in Table 1 below. · Introduction of a neighbourhood shopping centre and associated recreational and community facilities to contribute to resident’s sense of place and community engagement. · Ensure the long term sustainability of the total Waterside development site. As mentioned previously in this report, planning for the estate evolved in response to a number of on-site and surrounding physical characteristics, in particular flooding and industrial noise impacts. Delivery of employment opportunities is an underlying principle of Council’s vision for a sustainable City and the management of urban release areas. This position is enunciated in Council’s Management Plan and promoted through various mechanisms including Council’s Sustainability Blueprint for Urban Release Areas. Resolution of these principles is fundamental to development of the 2(h) Residential Services zone. The principal objective of the 2(h) Residential (Services) zone is the provision of employment opportunities which compliment the structure of the City, are compatible with the flooding characteristics of the locale and are provided within a quality built form that protects the aesthetic and acoustic environment of residential development in the adjoining 2(g) Residential (Waterways) zone. Precinct 1 is located on the corner of Andrews and Cranebrook Roads, a ‘gateway’ location to the City worthy of a particularly high standard urban design outcome. In response to this issue, planning for the estate has been premised on the establishment of a motel/conference facility in this location. This is reinforced by the stated objective of the zone to enable the development of the land for visitor accommodation. Stockland’s proposal for this precinct includes an 80 room motel, a licensed hotel (pub), child care facilities, a gymnasium, warehouses and light industrial uses. Stockland advise that have engaged a consultant to undertake a market potential report which indicates there is “limited potential for a major motel/conference facility at the site given the lack of a substantial office working population within the surrounding region and the site’s location not being particularly attractive for tourists (given the strength of the competing tourist facilities in the region)”. Any application to rezone/amend the zoning provisions of this land will need to substantiate this contention. Should this position be substantiated and given the significant tourism potential of the surrounding locality, in particular the Penrith Lakes Parklands, any alternative use of the site should not preclude the establishment of such a facility in the future. Further indication should also be sought as to how Stockland might address the perceived current misalignment between market conditions and the aspirations for this portion of the site, without precluding a solution in the longer term. Whilst warehousing is a permissible use under the current zoning, it would be necessary to amend the zoning provisions to enable ‘ancillary retailing’ associated with warehouse uses on the site. This prospect raises concern as it facilitates an alternative form of retailing (eg, bulky goods) and necessitates active policing to ensure compliance with the ‘warehousing’ intentions. Any application to rezone/amend the zoning provisions of this land will need to address these issues, particularly those implications for the established and proposed retail hierarchy of the City. Protecting the acoustic amenity of adjoining residential development is a principal objective of development within the 2(h) Residential (Services) zone. The introduction of industrial uses could conflict with is objective. However, the inclusion of nominated ‘light industrial’ activities that are consistent with the desired acoustic character of the locality, provides a suitable presentation to Andrews Road and are in character with the larger scale development of the locality as distinguished from small-scale strata unit development may be appropriate. Consideration could also be given to broadening the definition of ‘high technology industry’ to facilitate this course of action. Any application to amend the zoning provisions to enable light industrial uses would need to address these issues. Stockland indicate that the previously mentioned ‘market potential report’ identified “some potential for further tavern facilities within the trade area”. In some instances, Council has previously raised concern about the operation of stand alone tavern facilities where they have been proposed in close proximity to residential areas. We have suggested to Stockland the alternative they consider the integration of licensed premises within the motel. Stockland have indicated the intention to submit a “social impact assessment” with their application to amend the zoning provisions. The assessment will focus on surveillance, management, design and potential conflict with nearby uses. It is considered that the social impact assessment should be supported by documentation substantiating that there is community demand for such a facility in the locale (as distinct to the argument that such an establishment would be economically viable) and that it will make a positive contribution to the social fabric of the local community. Any application to amend the zoning provisions to enable a hotel (pub) would need to address these issues. Precinct 2 is located immediately to the east of Precinct 1 and the west of Main Lake 1, fronting Andrews Road. Stockland’s proposal for this precinct includes warehouses, light industries and office premises. Stockland have provided a concept masterplan for this precinct which provides for a 37 unit style development. Units vary in size between 135m2 and 360m2. Our comments on Precinct 1with respect to warehouse and light industrial uses also apply with respect to this precinct. Stockland propose to limit the amount of ‘stand-alone’ office activities to a total of 1,000m2 across the 2(h) Residential (Services) zone. No specific ‘commercial support services’ have been identified. Stockland argue that light industry/high technology business will require some commercial support services, with a preference that they are in close proximity. It is critical to consider the implications office development would have for the surrounding neighbourhood centres, both existing and proposed, and the Penrith City Centre. To allow unspecified ‘office premises’ risks the establishment of up to 1,000m2 of office users bearing no relation or connection to other site activities. It could even allow such space in one building. These implications would need to be addressed in any rezoning application, particularly those implications for the established and proposed commercial/office hierarchy of the City. Precinct 3 is located immediately to the east of Main Lake 1, fronting Andrews Road. Stockland’s proposal for this precinct comprises a neighbourhood shopping centre and a medical centre. The neighbourhood shopping centre would comprise a 2,800m2 supermarket and 1,700m2 of specialty shops. The medical centre would be some 200m2. The original planning for the estate did not identify the need for a neighbourhood retail centre at this location, however, it was recognised that it would be of advantage to the incoming residential community to be able to access daily convenience goods. To that end, a general store was promoted in the original masterplan for the residential precinct. Stockland, in their review of the masterplan, removed this facility. A retail centre in this locality has the potential to impact on the established and proposed retail hierarchy in the City. We have advised Stockland that it is necessary to substantiate that there is a demonstrated need for such activities on the site, that the 2(h) land is the appropriate location and that such uses would not compete with or have an adverse economic or social impact on existing or proposed centres. To this end Stockland have engaged Dimasi, a private consultancy to undertake an assessment of the economic impact of the proposed centre. It is important to ensure that there is an expert assessment made of the proposed retail facility and accordingly, we have requested Stockland’s support for Council’s engagement of an independent consultant to review the Dimasi report. We are currently seeking expressions of interest from suitable consultants. Precinct 4 is located immediately to the east of Precinct 3 fronting Andrews Road and extends north to interface with the 2(g) Residential (Waterways) zone. This precinct is the largest precinct in the Residential (Services) 2(h) zone and is located immediately opposite the Owens-Illinois plant (formerly ACI). Stockland propose the establishment of a 100-bed residential aged care facility and a retirement village comprising 120 villas and a community centre within this precinct. As mentioned previously in this report, the principal aim of the Residential (Services) 2(h) zone is the provision of employment opportunities which compliment the structure of the City, within a quality built form that protects the acoustic environment of residential development in the adjoining Residential (Waterways) 2(g) zone. Stockland are of the view that the seniors’ living facilities will aid in relieving the existing pressures on such services and accommodation types within Penrith and can be designed to provide both an acceptable residential environment for the occupants and protect the amenity of the Waterside residential area. Stockland has agreed for Council to engage an independent consultant to review the noise assessment prepared by Day Design Pty Ltd.
· The urban design implications of using residential buildings to provide the necessary acoustic protection for development in the Residential (Waterways) 2(g) zone. These concerns would need to be addressed in any rezoning application. Precinct 5 is located on the corner of Andrews Road and the extended Laycock Street, adjacent to the Integral Energy substation site. Stockland propose the use of this land for a service station, car wash, fast food take-away restaurant and industrial units. Whilst a service station, car wash and industrial units may be an appropriate uses in this precinct, it is questioned whether the provision of additional fast food establishments is required. Precinct 6 is located on Cranebrook Road to the north of the Andrews Road intersection. Stockland propose the deletion of employment opportunities and the establishment of some 20 additional houses in this location. We have raised concern at the prospect of deleting employment opportunities in favour of additional housing on the Waterside site. The original planning for the estate contemplated that the visitor accommodation and related uses on the Cranebrook Road / Andrews Road corner should ‘wrap’ around into the Cranebrook Road frontage of the site, reinforcing its significant gateway position. This issue will need to be carefully examined in the rezoning proposal from Stockland. The site and its use must also be viewed in the context of broader State Government planning policies. Council must take into consideration these strategies and policies in discharging its planning duties. Draft State Environmental Planning Policy No 66 – Integrating Landuse and Transport is of particular relevance to this site. This draft Plan seeks to more effectively integrate planning for transport with planning for future development of urban land to help moderate the growth in car use and support the community's investment in transport services. The Section 117 Ministerial Directions made under the Environmental Planning and Assessment Act reinforce these policies in the statutory plan making process. Stockland contend their proposal locates services and facilities within easy walking distance of residents/workers, reducing the reliance on and travel by car. This is certainly a benefit of locating daily convenience needs, in close proximity to residential areas. However, it does not address the broader issue of government policy that seeks to manage travel demand by locating trip generating development in established centres. This facilitates multi-purpose trips, supports established centres and supports the establishment and utilisation of high cost capital infrastructure. These issues need to be satisfactorily addressed any rezoning application. The principal issues arising from Stockland’s proposal revolve around the appropriateness of the proposed employment opportunities, particularly the retail, office and residential components in this context. A key concern which needs to be addressed in detail in Stockland’s formal rezoning proposal is whether there is a demonstrable need for an additional neighbourhood shopping centre in the locality and if so, whether this land is the correct location in terms of meeting the requirements of the wider community. This also extends to the proposal to enable ‘ancillary retailing’ associated with warehouse uses. The concept of providing commercial offices on the site which are not ancillary to industrial or warehouse activities also has the potential to impact on the established business centre hierarchy in Penrith and requires very careful examination. The proposal to establish a 100-bed residential aged care facility and a retirement village comprising 120 villas in such close proximity to industrial development and adjacent a significant road raises concern with respect to the impact of traffic and industrial noise on the amenity of the occupants and the subsequent impacts that may have on the future of nearby industrial development. The form and scale of this and other proposed uses along Andrews Road are critical issues to consider in relation to managing industrial and traffic noise, and also providing a quality urban design outcome. It remains to be established that there is community demand for a licensed premises (pub) on the site, particularly given the likely facilities which would be included within the proposed Penrith Lakes Centre opposite. Should Stockland’s proposal successfully address the issues outlined in this report, a mechanism would need to be devised to ensure delivery of employment opportunities as outlined in the Masterplan, rather than the potential emerging where certain uses could be expanded or particular uses (eg, motor showrooms, shops, fast food outlets) dominate the Andrews Road frontage of the site. Whilst it is recognised that there is an opportunity to expand the range of permissible uses in the Residential (Services) 2(h) zone, it is important for additional land uses to continue to deliver on the clear objective of creating employment opportunities and ensuring that the combination of uses and their resultant building forms along Andrews Road effectively mitigate noise impacts for the residential development adjoining to the north. The likely job creation suggested by Stockland will need to be more thoroughly detailed so that Council’s principles for ensuring job creation associated with new urban release developments are met. Importantly, job delivery also needs to be structured so that new business activities are located correctly and with the City’s existing retail and business enterprise hierarchy in mind. It would be appropriate for Council to formally advise Stockland of the issues identified in this report in their preparation of their formal rezoning proposal. To provide Council with an assessment of the draft Dunheved Precinct Plan including an examination of the key issues that have been resolved and the main amendments made to the draft Plan. The report also advises of the status of the draft Planning Agreement for the Dunheved Precinct. The report recommends support in principle for the draft Dunheved Precinct Plan with amendments as agreed by the proponent. The report also recommends the public exhibition of the draft Planning Agreement and other procedural steps to be taken. On 16 June 2003, Diane Beamer, who was then the Minister for Western Sydney and the Assistant Minister for Infrastructure and Planning, declared the Eastern, Dunheved North and Dunheved South Precincts to be the Stage 1 Release Areas for the ADI site. The Eastern Precinct Plan was adopted by Blacktown City Council on 4 February 2004. The LGA boundary between Penrith and Blacktown Council areas traverses the middle of the Dunheved Precinct. The draft Dunheved Precinct Plan was jointly lodged with Penrith City Council and Blacktown City Council on 30 April 2005. It is a consolidated plan that applies to both the North Dunheved Precinct and the South Dunheved Precinct. The Dunheved Precinct has a total area of 30.3 ha, which technically comprises a North Dunheved Precinct (18.4 ha) within the jurisdiction of Blacktown City Council and a South Dunheved Precinct (11.9 ha) within the jurisdiction of Penrith City Council. 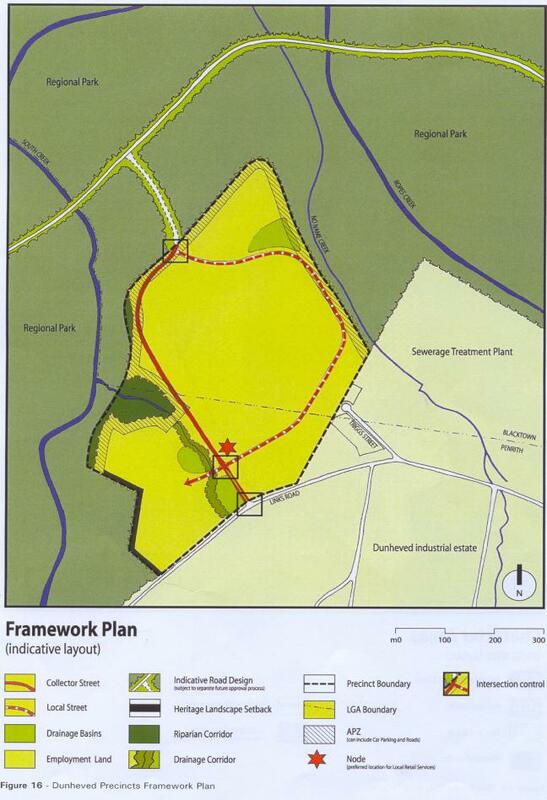 A copy of the ADI Site Precinct Plan is attached as Appendix 1. The Dunheved Precinct Framework Plan is attached as Appendix 2. Although the Minister has formally declared two separate precincts, DoP, Delfin Lend Lease and both Councils have agreed on the lodgement of a single Plan to be determined by resolutions from the two separate Council meetings. A joint planning process was held with Blacktown Council regarding the exhibition process, submissions from public authorities and assessment of key issues. Officers from both Councils and Delfin Lend Lease have held a number of joint workshops which have resulted in the determination of an agreed set of standards for the two precincts on issues such as road reservations, building setbacks, building heights and subdivision layout. The Employment Development Strategy (EDS) for the full ADI site was completed in June 2003 and endorsed by the Minister for Planning a few months ago. The Dunheved Precinct represents approximately half of the total land area zoned Employment within the site and is proposed to contribute 600 direct on-site jobs. On 10 June 2005 Delfin Lend Lease submitted a draft Outline Development Agreement (draft ODA) which was very limited in scope and proposed a small park facilities and bicycle network. 6. Council pursue the development of the Christie Street linkage in conjunction with Delfin Lend Lease (DLL) and the Roads and Traffic Authority (RTA), funding contributions from realization of surplus Council/DLL/RTA land. The submitted draft Outline Development Agreement (draft ODA) was considered inadequate due to the absence in the draft ODA of contributions for Local Road and Intersection Upgrades and Additional Local Road and Intersection Upgrades. Both Penrith and Blacktown Council also considered that the proposal for Local Parks in a future industrial release area was considered to be inappropriate due to the potential maintenance obligation and as it was not expected to be extensively used. Copies of the draft Precinct Plan as submitted to Council on 30 April 2005 were distributed to Councillors in September 2005 prior to the public exhibition process. A copy of the draft Plan incorporating a number of amendments negotiated with Delfin Lend Lease since that time has been recently distributed to Councillors. (iii) with amendments not agreed to by the proponent, but only with the consent of the Minister. Council cannot refuse to adopt a draft Precinct Plan unless it has obtained the agreement of the Minister to the refusal. Although a Council technically has 6 months in which to adopt a precinct plan, Delfin Lend Lease and the two Councils agreed to extend the assessment period so that additional work could be carried out by consultants and submitted to Council for assessment. · Forrester Road/Christie Street intersection to South Creek. · Upgrade Links Road (both sides) along Dunheved Precinct boundary. · 5 m wide shared pedestrian and cycle path. Penrith City Council Foyer, Penrith Library, Penrith Council’s St Marys Office, St. Marys Library, Blacktown City Council and Mt Druitt Library. The exhibition of the draft Plan was also advertised in local newspapers covering relevant areas in Penrith and Blacktown. Notification letters were sent to landowners in residential areas surrounding the North and South Dunheved Precincts. A comprehensive range of public authorities, Local Members, local community and business groups, including Dunheved Industrial Development Committee and ADIRAG, were notified in writing of the exhibition and invited to comment. Council has received a total of 30 submissions to the exhibition comprising a petition with 89 signatures, two individual letters, seven form letters and 20 submissions from Public Authorities, Service Authorities and Emergency Services organizations. A summary of the submissions made and a brief assessment of those submissions is provided below. A detailed listing of the issues raised in submissions and a full assessment is provided in Attachment 1. Two individual submissions have been received. Both submissions object to the draft Plan. The issues raised related to potential flooding and the biodiversity assessment. · The filling of the floodplain will impede creek flows and result in upstream flooding. The flood modelling carried out has demonstrated that if all proposed ameliorative measures are implemented, there will only be ‘minimal’ increases in flood level upstream of the site of 37mm and downstream of the site of 11 mm. Council staff are satisfied with the methodology undertaken in determining the flood level and with the negligible affect that the filling of this part of the flood plain would have. This matter is addressed in more detail later in this report. · The Biodiversity Assessment Report is grossly inadequate. The site has a high representation floristically of species for a remnant on the Cumberland Plain. The submission also opposes the filling of the floodplain as it will potentially cause problems for the downstream property owners. The biodiversity value of the Dunheved Precinct needs to be viewed in the context of the wider biodiversity conservation outcome for the whole of the ADI Site, including the preservation of a substantial Regional Park of 900 ha. This assessment has been supported by the Department of Environment and Conservation (DEC). It should also be noted that a significant riparian corridor along the tributary to South Creek is to be established. This issue is further addressed later in the report. Seven form letters and a petition raising the same issues as the form letters and containing 89 signatures have been submitted. The issues and our commentary is included in Attachment 1. A summary of the points raised is outlined below. · Object to the development of the floodplain, seek the collection of new floodplain data prior to the approval of the Precinct Plan and ask where is the equivalent area of compensatory floodplain storage situated? · Opposes any increased traffic on Dunheved Road. Council’s flood policy generally does not support filling of the flood plain (1% AEP flood level) unless it can be demonstrated that no detrimental effects will occur as a result of the filling and any associated mitigation works. The proponent carried out a modeling exercise that used the most contemporary flood model that was available (the 1991 Flood Study). The approach which was undertaken in the use of this modeling, looked at the differences in the flood levels upstream, downstream and across the site as a result of the proposed filling and mitigation measures. The model that was used for this is considered to be adequate for this exercise. The modeling was also scrutinized by Department of Natural Resources (DNR) and subjected to a peer review by an independent consultant. Both DNR and the consultant arrived at the same conclusions and have endorsed the study outcomes. This approach is also consistent with State Government’s Floodplain Management Manual . Details relating to the method of filling the land are more appropriately dealt with at the DA stage once the sources of fill material are known. A Development Agreement, which is now known as a Planning Agreement, under the new legislation, should not be confused with a Public Private Partnership (PPP). A PPP is an altogether different process where Government may elect to enter into a contract with a private organisation for the carrying out of works in return for that organization receiving a share of the revenue so generated, such as a tollway. A Planning Agreement is a contractual agreement between the planning authority and the developer. On 8 July 2005, the Environmental Planning & Assessment Act, 1979 (EP&A Act), was amended to allow planning authorities to use planning agreements as a means to obtain contributions for a public purpose. The purpose of a Planning Agreement is to ensure that developers put in place infrastructure in a timely manner using a process that is more suitable or flexible than the traditional Section 94 process. The signing of a Planning Agreement by a Council does not bind or fetter that Council in the carrying out of its statutory planning obligations under the EP& A Act. Dunheved Road is a strategic road corridor that has been planned to convey traffic in an east west direction across a major part of the City. The current construction has been designed to allow for future lane amplification. The need for this upgrade will be driven by future traffic being generated by all of the release areas in the LGA. A total of 20 submissions have been received from public authorities, which are listed in Attachment 1. Although no public authorities objected to the draft Plan, a total of 5 public authorities have raised issues that need to be addressed. These authorities are DNR, DoP (Metro Planning & Transport Strategy), MoT, Sydney Water and the RTA. The draft Plan has been amended to meet various minor changes requested by DNR. Key issues resolved include the use of a 20m wide riparian corridor in lieu of a proposed 20m wide drainage and use of combined water quality basins rather than detention/infiltration basins. A number of issues raised by DoP have been resolved including phasing of development, flood evacuation, journey to work modal split, retention of trees and impact of development upon flood levels. DoP also sought more detail on future bus services and the form and management of public transport promotion, including timeframes for implementation of public transport improvements. These are valid queries, however the responsibility for the location of bus routes, frequency of service and provision of public transport improvements rests with the Ministry of Transport (MoT). This issue is further discussed in the following item. The St Marys Development Agreement (The Deed) and the 2005 Transport Management Study (2005 TMS) (currently being updated) provide the planning and legal framework for the provision of the scheduled regional and local road and intersection upgrades. A series of public transport improvements will be carried out following the finalisation of the 2005 TMS. The Deed does provide for public transport promotion and for the subsidization for the cost of an interim bus service. Although the ADI site is currently being developed in a staged fashion, transport planning for the site is being delivered on a whole of site basis. The future declaration of additional precincts by the Minister will assist in the delivery of an integrated approach to provision of bus services across the ADI site. It is considered that the draft Dunheved Precinct Plan demonstrates good bus connectivity, recognizing that the internal road connectors that will ultimately link Dunheved Precinct to the Western, Central and Eastern Precincts are yet to be planned in detail and delivered. Council should strongly support the use of available funds within the Deed for transport promotion. · Sydney Water requests that both flushing of toilets and all irrigation needs be met from use of recycled effluent. They have also requested that use of recycled effluent for industrial operations be actively pursued. · Sydney Water argues that recycled effluent should be used at all times for both flushing of toilets and irrigation use. It is argued that the use for toilets only would have implications for pipe size, costs and system design and would lead to a deterioration in water quality when recycled water is held in pipes for long periods. (ii) developments that consume high volumes of water in their operation shall incorporate recycling initiatives in the plant’s operation. · Regarding Council’s request for the dedication of part of the RTA owned land related to establishing the new Link Road to Christie Street, the RTA has not been able to consider the request in the absence of detailed information regarding the extent of land needed and the specific purpose it is required for. Council agrees with the RTA’s suggestions for road improvements to Forrester Road, Links Road and Christie Street and these are included in the schedules to the draft Planning Agreement. Council officers would support the early provision of traffic signals. The establishment of a four way intersection with the new Link Road, Christie Street and Leeholm Road is supported as the most appropriate location to provide the new traffic link into the existing Dunheved Estate. It is appropriate that bus priority measures be considered at this intersection given Christie Street will ultimately form part of the Werrington Arterial. The use of the RTA land off Christie Street to facilitate the Link Road is critical and we will be continuing to negotiate this aspect with the RTA once a design for the intersection is available. This issue is discussed later in the report. 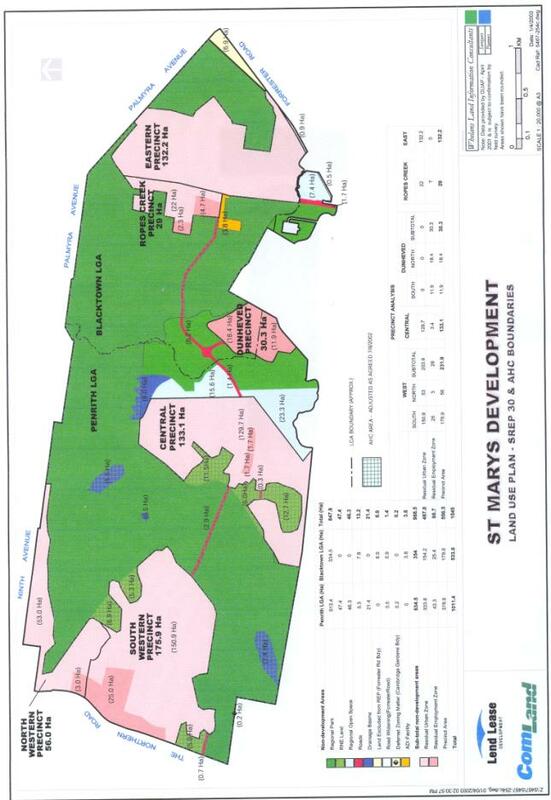 · The St Marys Development Agreement (The Deed). The draft Plan and draft Development Control Strategy has included the required matters listed under SREP30. The draft Plan is also considered to have met the required performance objectives listed in the Environmental Planning Strategy (EPS). Clause 11 of SREP 30 provides amongst other things, that a Precinct Plan must not be approved unless Council is satisfied that the Plan is consistent with the performance objectives, zone objectives and requirements prescribed by the SREP and the proposed development controls proposed in the St. Marys Environmental Planning Strategy 2000 (EPS 2000). Council must also ensure that the Precinct Plan is substantially in accordance with the Structure Plan under SREP 30. The draft Precinct Plan and draft Development Control Strategy together address the full range of issues required under the above provisions of SREP 30. The draft Plan is also consistent with the Structure Plan under SREP 30. A number of issues have emerged from both consideration of the submissions raised during the public exhibition as well as from our own assessment and the discussions we have held with officers of Blacktown Council. The key matters are outlined below together with relevant commentary. It will be noted that in a number of instances, we have reached agreement with Delfin Lend Lease to amend the draft Precinct Plan. A detailed list of these amendments are provided at Attachment 2 to this report. The following section also includes commentary on a number of queries raised by Councillors at the presentation provided on the Dunheved Precinct Plan at the Policy Review Committee meeting 27 June 2005. A copy of the Draft Dunheved Precinct Plan with the amendments outlined below, as agreed by Delfin Lend Lease and Blacktown Council, has been separately distributed to Councillors. However, a number of the Management Plans and Strategies, which are the supporting documents for the draft Dunheved Precinct Plan, are currently still being revised by Delfin Lend Lease. The details of these amendments are outlined in Attachment 4. At the request of the two Councils, a Peer Review was carried out by Bewsher Consulting “to study and access the technical veracity of the modelling undertaken by SKM.” The two Councils chose Bewshers as this organization is considered to be well equipped to access the modelling methodology employed. Bewshers concluded that “the methodology used by SKM to model the proposed fill areas and flood storage areas within the site follows normal and accepted modelling practice. There is documentation available to substantiate much of the methodology and results. We have not found any information which raises significant concerns about the modelling work undertaken by SKM.” This outcome has also been endorsed by the Department of Natural Resources. · Alternative modelling scenarios based on a reduced development have delivered no significant reduction in flood levels. This additional work has further demonstrated the original modelling results that minimal increases in flood level can be expected to occur as a result of the proposed development. Council, in the implementation of its flood policy, has not favoured substantial filling of flood plains. In cases where small scale filling of flood liable areas has been agreed to, Council has insisted upon compensatory flood storage being provided. Council’s “Interim Policy for Development of Flood Liable Land” employs a “merits based” approach for assessment. At Council’s request, the applicant has provided clarification on the rationale of their flood modelling approach. Given the proximity of the Regional Park, the option of compensatory flood storage being provided by excavation is not as feasible as it would be in other locations. As a result, the Delfin consultants examined other appropriate measures to reduce the flood impact. The submitted information from SKM indicates that minimal increases to both upstream and downstream flood levels will be achieved by the development of the Dunheved Precinct if certain flood mitigation measures are implemented. This approach is to raise the level of two bridges which span both Ropes and South Creeks and to remove the approach embankment for the old munitions bridge in order to increase the cross-sectional channel volume for Ropes and South Creeks. This allows the required performance standards in SREP 30 and the EPS to be met. The means of importing the fill material, including ensuring that the source of fill for the Dunheved Precinct is free from any form of contamination and is validated as safe for filling purposes are detailed matters that will be canvassed in subsequent development applications. We are satisfied that the issues raised in the 27 June 2005 report to Council concerning the flooding implications of filling the Dunheved Precinct have been satisfactorily addressed. The majority of the Dunheved Precinct has been cleared however areas of vegetation remain in the north, southwest and southeast of the site. The development of the Dunheved Precinct will result in the removal of areas of three endangered ecological communities, two threatened flora species and a number of Blue Box trees that are regionally significant. The retention of significant trees will be possible within the riparian and drainage corridors in the southwest of the site, however the proposal for filling of the site to a depth of 1.0-1.5 m will generally prevent the retention of existing vegetation within the precinct. The proponents have undertaken a comprehensive 8 Part Test for the endangered and threatened species consistent with the provisions of the Environmental Planning & Assessment Act, which indicates that the loss of the vegetation is not of significant impact. DEC has indicated in its submission that provided that plantings and weed management policies within the Dunheved Precinct are sympathetic to the management of the biodiversity within the Regional Park, the DEC has no significant concerns with the biodiversity impacts of the draft Plan. Despite the loss of vegetation (approx 3 ha) on the Dunheved Precinct, it is reasonable to conclude that this is more than balanced by the protection of significant areas (900 ha) of endangered woodland within the adjoining Regional Park. It is also reasonable to conclude that although the development of the Dunheved Precinct will result in the removal of scattered woodland, the development will not have a significant effect upon any threatened flora or fauna species. Following the request of DNR, Delfin Lend Lease has agreed to Council’s request to replace the proposed 20m wide drainage corridor in the upper reaches of the creek in the south-west of the site with a 20m wide riparian corridor. DNR has also requested that there be no development lots backing onto any riparian corridor and Delfin Lend Lease has agreed that, where practical, perimeter road or track will be provided adjacent to any riparian or drainage corridor within the precinct. DNR raised concerns that the concept of using infiltration basins to treat water quality may have implications for salinity on the site. Delfin Lend Lease, in reconsidering this aspect, has agreed to replace the infiltration basins with combined detention and water quality basins. Bioretention swales convey and filter stormwater run-off through the use of vegetation as a filter medium. Delfin Lend Lease originally proposed to locate bioretention swales along both sides of all roads within the precinct as an integral part of the stormwater quality management and trunk drainage system. We have however, expressed concern in this application at the ongoing costs to Council of maintaining such infrastructure and queried the practicality of locating swales in an industrial area which is subject to heavy traffic movements. We requested that bioretention swales be limited to the western side of the main collector road only. Delfin Lend Lease has accordingly amended the draft Precinct Plan. At the request of both Councils, the two proposed Local Parks have been removed from the original draft Dunheved Precinct Plan as it was considered to be a maintenance liability and unlikely to be regularly used, given its location in an industrial area. As an alternative, the draft Planning Agreement which has recently been submitted to Council includes as a proposed scope of works a paved, shaded outdoor eating area, approximately 100-150 square metres, incorporating seating, shade structures and tree planting. This is proposed to be established prior to 75% of industrial establishments being established within the North and South Dunheved Precincts. Delfin Lend Lease will also use reasonable endeavours to ensure that a convenience and retail foods outlet is established in either of the Dunheved Precincts. The draft Precinct Plan also requires that a passive recreation area be provided on each allotment for use by employees. The draft Precinct Plan has been amended to include two bus stops and two bus shelters at both the northern and southern ends of the main Collector Road servicing the Dunheved Precincts. Officers from both Councils devised a consistent set of standards for both road carriageway widths and road reservation widths for both the main Collector Road and the other roads within the draft Precinct Plan. The general principle adopted was to utilize the higher road standard from either Council and accordingly Delfin Lend Lease has now agreed to adopt road carriageway widths of 15.5m and 13.5m for Collector Road and Other Roads respectively. The road carriageway widths and road reservation widths have increased from those exhibited in the draft Precinct Plan. A 3m wide parking lane has also been added to the western side of the Collector Road so that this may also be utilized as a breakdown lane. In its submission to Council, Sydney Water requests that both flushing of toilets and all irrigation needs be met at all times from the use of recycled effluent, rather than from a combination of recycled effluent and stored water from rainwater tanks. It is argued that the use of recycled effluent for toilets only would have implications for pipe size, costs and system design and would lead to a deterioration in water quality when recycled water is held in pipes for long periods. They have also requested that the use of recycled effluent for industrial operations be actively pursued. Delfin Lend Lease argues that use of recycled effluent at all times for irrigation could potentially generate higher salinity levels and consider that they should not be forced to use recycled effluent when rainwater is available in tanks. It is considered that, where available, rainwater should be utilized for irrigation in order to reduce salinity, reduce costs and for sustainability reasons. Delfin Lend Lease was asked to negotiate the matter with Sydney Water and have commenced discussions with that authority. The two Councils and Delfin Lend Lease have agreed to amend the draft Plan to include development controls to require: (i) the developer to provide all allotments with a separate piped supply of treated effluent from the St Marys STP, subject to continuing negotiations with Sydney Water, and other appropriate measures such as rainwater tanks; (ii) developments that consume high volumes of water in their operation shall incorporate recycling initiatives in the plant’s operation. Although Council cannot enforce the signing of commercial contracts by developers, we are nevertheless keen to ensure that modern telecommunication infrastructure and services are provided to the Dunheved Precincts. The draft Precinct Plan has therefore been amended to require the provision of modern telecommunication infrastructure and services subject to continuing negotiations with service providers. In our assessment of the proposed development controls contained within the Precinct Plan, we have discussed a number of appropriate changes with Blacktown Council officers to ensure that both Councils’ existing controls for employment precincts can be consistently meshed into the requirements for Dunheved Precinct. The key amendments made to Part 4 of the draft Dunheved Precinct Plan (draft Development Control Strategy) are summarized below. The minimum lot width at the primary street frontage has been increased to 50m on the Collector Road and retained at 35m on other roads as the larger lots were expected to be located along the Collector Road. Specific salinity objectives and controls have been added to the draft Plan in order to manage and mitigate the impacts of, and on, salinity. A specific control has been inserted into the draft Plan in order to ensure that loading docks, loading areas and external storage areas shall be appropriately located and/or screened so as to not be visible from the Regional Park. The draft Plan has been amended to reflect increased front building line setbacks. The front setback for the Collector Road has been increased from 5m to 9m and from 5m to 7.5m for other roads. A specific control has been added to the draft Plan to prevent the location of water tanks within the front setback and to require screening. Minimum landscape requirements for front setback areas have also been added. The draft Plan has been amended to specifically require carparking to be located behind the required minimum front landscaped setback area. The draft Plan has also been amended to remove the specific controls that previously permitted carparking to be shared between neighbouring lots and which also permitted shared access and turning areas between neighbouring sites. These two latter controls have been deleted as officers considered that they would create on-site problems. A requirement for a minimum passive recreation area on each lot for use by employees has been added to the draft Plan. The draft Plan has included a maximum fence height of 1.8m in order to screen the rear of the lots from adjacent sites. Specific Controls relating to building design and building materials have been added to strengthen the draft Plan. At Council’s Policy Review Committee Meeting held on 27 June 2005, Council resolved, in part, that a report be prepared on the funding that may be required for the ongoing maintenance of drainage basins, riparian corridors, bioretention swales and the Asset Protection Zone. Following discussions with officers from both Councils, Delfin Lend Lease has agreed to the removal of the proposed Local Parks in both North and South Dunheved Precincts. Penrith Council officers and Delfin Lend Lease have reached agreement that the bioretention swales should be retained on the western side of the Collector Road, but removed from other parts of the South Dunheved Precinct in order to reduce maintenance costs and as the bioretention swales were not considered to be a viable application in an industrial area. Delfin Lend Lease submitted a “Landscape and Open Space Handover & Maintenance Plan” with the draft Dunheved Precinct Plan. This Plan outlines an 8 stage process which includes separate phases for approval, construction, practical completion, contract maintenance, handover and ongoing maintenance by Council. It is also proposed that a ‘Landscape and Urban Design Strategy’ be prepared as a supporting document to the draft Dunheved Precinct Plan, should it be adopted. This strategy will include, amongst other things, relationship to the site open space hierarchy, standards for public domain character and presentation, design and materials treatments and principles for landscape implementation and maintenance. Officers have carried out an investigation of the likely ongoing maintenance costs to Council of these assets and have requested that a Maintenance Management Plan and schedule of estimates of costings be submitted to Council. This is currently being prepared by Delfin Lend Lease. We have requested that the pre-handover periods for drainage basins, riparian corridors and bioretention swales be set at 3 years and the pre-handover times for bushland and woodland be set at 12 months instead of 6 months. Delfin Lend Lease as agreed to those arrangements. The ADI site has been the subject of extensive investigation and remediation through the 1990’s. The work was undertaken with the full involvement of the EPA and subsequently by an independent NSW EPA accredited Site Auditor who produced and issued the Site Audit Statements for the whole of the ADI site (Stage 2 Decontamination Audit of ADI St Marys Munitions Factory, dated 7 June 1999). The site has been remediated to a level where it is considered to pose a negligible risk to the public or the environment with regard to chemical contamination or explosive ordnance. The submitted ‘Contamination Management Plan’ presents information from the remediation and validation reports for the Southern Sector East (which covers the Dunheved Precinct) and other pertinent information from the whole of the site. The objective of the Plan is to provide a framework for identifying and addressing any unexpected discovery of chemical contamination or potentially explosive ordnance and to ensure a safe working environment. Council has been attempting to obtain a signed Deed of Indemnity for the former ADI site from the Commonwealth Government since May 2004. The intention of the Deed is to seek the Commonwealth Government to indemnify Council against all actions, claims and damages arising from any claim by the future land owners of the ADI Site from any currently unforeseen source of contamination. Notwithstanding that Blacktown City Council received a signed Deed of Indemnity from the Commonwealth Government in the late 1990s, the Commonwealth Government has advised that it cannot now provide an indemnity out of a purported obligation arising from a similar indemnity provided to Blacktown City Council. We have been advised that Council has no legal entitlement to an indemnity from the Commonwealth Government. We have sought from Council’s solicitors, Phillips Fox, advice whether Council has an argument that the Commonwealth Government should execute the draft Deed of Indemnity. We are advised that the Commonwealth Government has implemented a policy which states that a set of guidelines should be satisfied before the Commonwealth provides an indemnity. In August 2005, Council wrote to the Commonwealth Department of Finance and Administration and addressed the specific criteria listed in the guidelines provided by the Commonwealth Government. The Commonwealth Government advised that the Council’s submissions have not identified any clear risk to Council, or basis for the Commonwealth to issue an indemnity. The Commonwealth Government has advised that it is of the view that the draft indemnity provides no further protection to Council than that afforded by section 145B of the Environmental Planning and Assessment (EP&A) Act. This Section provides that if the Council acts in good faith with respect to issues of contamination in planning for future development of the area, that the Council will not be liable to any party at law. Council’s solicitor has advised that it would appear that the Commonwealth Government accepts that the land is contaminated, but asserts that the question as to whether the Commonwealth should take responsibility for that contamination depends upon the Council identifying a particular risk to it, in relation to which it is not afforded protection under Section 145B of the EP&A Act. Council’s solicitors have advised that the draft indemnity is of limited scope and operation and consider that there are very few circumstances where the draft indemnity would act in favour of the Council. The solicitors have advised that the draft indemnity would not apply to the Council where the good faith defence is available under section 145B of the EP&A Act. Notwithstanding that the Commonwealth Government has so far refused to sign the Deed of Indemnity, our solicitors advise that a considerable degree of protection is available to Council under section 145B of the EP&A Act and it is reasonably considered that this should not otherwise prevent Council from adopting the draft Dunheved Precinct Plan. The gazettal on 8 July 2005 of the Environmental Planning and Assessment Amendment (Development Contributions) Regulation 2005 has extended the means by which planning authorities may obtain development contributions to be applied for the provision of public amenities and services and for other purposes. Local government now has the capacity to negotiate with developers in order to seek the provision of contributions towards facilities and services within Planning Agreements. This level of legal certainty was not previously available to Councils when negotiating developer agreements. A draft Outline Development Agreement was lodged with Council in August 2005. However, based on the legal advice we have received, we have considered that the Councils should utilize the new Planning Agreement legislation as the appropriate legal mechanism for the delivery of contributions and services for the Dunheved Precinct. Council has been specifically requested by Delfin Lend Lease to permit a draft Planning Agreement to be created under Part 3 of the St. Marys Development Agreement that it has entered into with the State Government. Council’s solicitors have provided legal opinion to Council on this matter and have indicated that there would be no disadvantage to Council in following this approach. A draft St Marys Penrith Planning Agreement has been prepared by the proponent and was submitted to Council in April 2006 following extensive negotiations with Delfin Lend Lease. This draft Planning Agreement supersedes the former draft Outline Development Agreement that was formerly exhibited alongside the draft Dunheved Precinct Plan. A copy of the submitted Schedules to the draft Planning Agreement, as currently amended, appears as Attachment 3. · Christie Street - between Forrester Road Roundabout & South Creek. · Plan Administration Charge for Planning Agreement. Given the expanded content of the negotiated infrastructure now agreed to be delivered, it is considered that Council can endorse the proposed works schedules for inclusion into the draft Planning Agreement. If Council is of a mind to agree to the proposed works, once a response has been received from our solicitors and any necessary amendments made to the provisions within the Agreement, it would then be appropriate for the draft Planning Agreement to proceed to public exhibition. It would be appropriate for Council’s Legal Officer and Environmental Planning Manager to be given delegated authority for finalizing the Planning Agreement for public exhibition. It is relevant to note that once Council adopts a Precinct Plan, development proposals can be submitted to Council, with the expectation that they will be determined. The legal advice received from Council’s solicitors has recommended that the draft Planning Agreement be finalised, publicly exhibited and duly executed prior to formal adoption by Council of the draft Dunheved Precinct Plan and supporting documentation. This will ensure there is a clear infrastructure delivery mechanism endorsed by Council before Development Applications are required to be determined. Council in its last consideration of the Dunheved Precinct Plan urged that further discussions be held with Delfin Lend Lease and the RTA concerning the most appropriate means to achieve a new link road between the existing Dunheved Estate and Christie Street. Since that time, we have had extensive discussions with these two stakeholders, as well as the convener of the Dunheved Industrial Development Committee. Those discussions have ranged around agreeing on the most appropriate alignment and land take for the proposed road, estimating the cost of the new works and looking at a process for freeing up otherwise land locked or under-utilised land holdings in the immediate area to provide a means for funding the link road construction. Delfin Lend Lease has submitted to Council a draft Concept Plan for a link road between the Christie Street/Lee Holm Road intersection to a point adjacent to the Dunheved Golf Course. This proposal was recently presented to the Councillor Workshop held on 8 May. The Concept Plan nominates a proposed route and an initial estimate of costings. The proposal has been referred to the RTA who have indicated a preferred intersection geometry with Christie Street. Delfin Lend Lease has been requested to finalise a concept design for the intersection. · Providing a catalyst for development renewal in the adjoining industrial areas. The RTA in discussions has indicated support in principle for the proposed Link Road. They have also indicated the importance of ensuring that there are appropriate turning lanes provided at the intersection as well as providing for future bus priorities. The RTA is yet to formally confirm its preparedness to dedicate the Link Road corridor to Council as road, however this is expected soon. Given that taking the approach outlined above will take some time to advance, we have discussed with Delfin Lend Lease the most appropriate mechanism for moving forward to determine the final design, cost, funding arrangements and delivery mechanism for the Link Road. To that end, Delfin Lend Lease has proposed entering into a Heads of Agreement with Council to delineate a collaborative process for the parties to move forward to establish the Link Road. Delfin Lend Lease has offered to act as project manager to facilitate the investigations and the development of the adjoining land. The Heads of Agreement is intended to establish a framework for the development of the land and the further assessment, design, approval, funding and construction of the Link Road. It is intended to establish a Project Control Group for the Link Road to advance the project. The objectives of the Project Control Group will be to enable the further assessment, design, approval, funding and construction of the Link Road and to determine the manner of the apportionment of the funding and the relevant benefiting ownerships required to deliver the Link Road. In our view, this is an appropriate course of action particularly and would effectively delineate responsibilities for a joint approach to delivering the Link Road. A draft of the Heads of Agreement has been recently submitted to Council and is currently being assessed by the Legal Officer. In our view, it would be appropriate for Council to resolve to enter into a suitable Heads of Agreement once the terms of that arrangement have been finalised and the Legal Officer be delegated the authority to endorse the final Agreement. A series of Management Plans and Strategies has been prepared to sit alongside the draft Precinct Plan and draft Development Control Strategy to provide more detailed information and guidelines concerning specific management responses that will be required over time to support the development. Those are outlined in the earlier section titled ‘Assessment of Draft Precinct Plan’. In discussions with Delfin Lend Lease and Blacktown Council, a number of mostly minor amendments have been agreed to advance to the supporting documents, and are outlined in Attachment 4. These however are yet to be completed. Council’s solicitors, Phillips Fox, have advised that given there are a number of Management Plans and Strategies which form part of the draft Dunheved Precinct Plan and which are yet to be amended by Delfin Lend Lease, it is not considered prudent for Council to formally adopt the draft Dunheved Precinct Plan at this stage. Council could however, based on the level of agreement reached with Delfin Lend Lease and the amendments now made to the draft Precinct Plan, give consideration to endorsing the draft Precinct Plan in principle, and with a formal approval being subject to the satisfactory execution of the Planning Agreement and the receipt of all necessary amended documents. The Dunheved Precinct will make a notable contribution to delivering new employment opportunities, not only in relation to the ADI Site development, but also in relation to Council’s aspirations to creating new jobs across the City. It also represents the first phase of implementation of the ADI Employment Strategy within Penrith, which is the vehicle to ensure that Council’s policy of creating new jobs in association with this new urban release area development materialises. The public submissions made to the exhibition of the draft Dunheved Precinct Plan have been carefully assessed and it is considered that the issues raised have been effectively dealt with in relation to the proposals advanced by Delfin Lend Lease and the amendments made to the draft Precinct Plan. The submissions received from the State Government authorities have been appropriately addressed and the relevant aspects identified in the report incorporated in the amended draft Precinct Plan. As indicated in the report, issues raised concerning the early provision of bus services will require further addressment by the MoT and it is recommended that we write to that agency to seek their advice as to the appropriate timing for this consideration to occur. Engineering consultants carried out a detailed flood modelling exercise, and a separate engineering consultant also conducted a peer review process. In our view, the studies carried out demonstrate that the proposed development will have minimal impact on flood levels. In relation to the funding of management arrangements previously raised by Council, Delfin Lend Lease has agreed to pre-handover periods of 3 years for drainage basins and increased pre-handover periods of 3 years for riparian corridors and bioretention swales for this site. Delfin Lend Lease has also agreed to increase the proposed contract maintenance period for bushland and woodland from 6-12 months. In our view, this is an appropriate outcome. Despite our endeavours to obtain a signed Deed of Indemnity from the Commonwealth Government in relation to the past contamination of parts of the ADI site, Council’s solicitors have advised that the draft Indemnity is of limited scope and may not provide for any substantial protection in addition to that now provided by the changes to the Environmental Planning and Assessment legislation. Both Council’s solicitors and the Legal Officer have advised that it is reasonable to consider Council should not be prevented from adopting the draft Dunheved Precinct Plan in the absence of obtaining the Indemnity. Extensive negotiations have been held with Delfin Lend Lease to arrive at an agreed schedule of infrastructure works required to support the development of the Dunheved Precinct. Those works include measures which would be immediately required as a result of development occurring in this Precinct, as well as the implications created from Blacktown Council endorsing the development of the Eastern (Ropes Crossing) Precinct. In addition, Delfin Lend Lease has agreed to accelerate a number of road works that would be more relevant to support the development of the Western and Central Precincts yet to be released, but for which there is advantage in bringing forward in order to support the development of the Dunheved Precinct. Accordingly, it is recommended that Council endorse the works schedules attached to the report as the basis of the draft Planning Agreement to be publicly exhibited in accordance with the provisions of the Environmental Planning and Assessment Act. In relation to advancing the establishment of a new Link Road between the existing Dunheved Industrial Estate and Christie Street, a mechanism to move forward has been negotiated with Delfin Lend Lease and it is recommended that Council enter into a suitable Heads of Agreement to provide the means for a collaborative approach to be pursued to the design and delivery of the new Link Road. Given the current status of the advancement of the proposed Planning Agreement and the need to have revisions of all documents supporting the draft Precinct Plan finalised, it is not considered appropriate for Council to formally adopt the Precinct Plan at this stage. However, in order to provide some clarity for the proponent so that they may commence consideration of the next development phase for the Dunheved Precinct, it is relevant for Council to indicate that it is fundamentally satisfied with the outcomes reached to-date. Accordingly, it is recommended Council provide in principle support for the draft Dunheved Precinct Plan. A further report will be presented to Council following the exhibition of the draft Planning Agreement and receipt of the revised draft Precinct Plan and supporting documentation. This would allow consideration by Council of the formal adoption of the Dunheved Precinct Plan and the related Planning Agreement to be executed concurrently. 2. Council endorse in principle the draft Dunheved Precinct Plan submitted by Delfin Lend Lease, with the amendments as agreed to by the proponent outlined in the report and in the attachments. 3. A further report be presented to Council following the exhibition of the draft Planning Agreement and receipt of the revised draft Precinct Plan and supporting documentation for consideration of the formal adoption of the two documents. 4. Council endorse the proposed works schedules included in the Attachments to this report for their inclusion in the draft Planning Agreement. 5. Council publicly exhibit the draft Planning Agreement in accordance with the provisions of the Environmental Planning & Assessment Act, 1979 and Regulations and authorise the Legal Officer and Environmental Planning Manager to finalise the content of the draft Planning Agreement prior to the formal public exhibition process. 6. Council enter into a Heads of Agreement with Delfin Lend Lease regarding the advancement of the proposed Link Road between the Dunheved Industrial Area and Christie Street and that the General Manager be authorised to execute the Agreement. 8. Delfin Lend Lease be advised of Council’s decision. Strategic Program Term Achievement: The City’s business community, learning institutions and training institutions are working in an integrated way to strengthen and develop the City’s local economic base. To inform Council of the activities and projects undertaken by the Corporation for the July-December 2006 period. The report recommends that the Corporation's report be received. At its August 2005 Policy Review Committee meeting Council endorsed the Penrith Valley Economic Development Corporation’s business plan and funding in the amount of $251,567 for the 2005-06 financial year. Council also asked that a six monthly report be presented on the performance of the Corporation that would focus in the main on the projects undertaken by the PVEDC. The Corporation is currently engaged in a strategic review process to better clarify its role in relation to Council and other business services providers in the city and to adopt a performance based, project driven program of action which is clearly aligned with its Strategic Plan. The process has involved all the four task groups which are responsible guiding the delivery of the Corporation’s programs. The comprehensive business survey conducted the PVEDC late last year will prove invaluable in providing clear directions on how the Corporation can address the key needs of its constituency: the enterprises that operate in Penrith..
A full review of the outcomes of this work will be provided to Council in the July policy review committee meeting when Council is asked to consider PVEDC’s business plan and endorse funding for the 2006-07 financial year. Increased income has been brought about through extra functions and sponsorship monies. These extra funds are being offset by related project/program expenses. There is an expected surplus for the financial year for the Corporation of $388. · Western Sydney Advisory Centre operating and achieving goals set as per contract. · Penrith Valley Home Based Business Network (PVHBBN) meetings successful. All functions held have been well attended with increase of attendance, and high profile speakers invited to present at meetings. PVHBBN website attracting a number of new enquiries to the network. · Two CEO Dinner’s successfully held (August and November) with full sponsorship received for the dinner. Positive feedback received for both topical guest speakers, Bill Duncan, Chairman of GROW (August), and Joe Catanzariti, Partner at Clayton Utz – Sydney (November). · Successfully secured sponsorship for the next CEO dinner to be held in March 2006, with the CEO of McDonald’s as guest speaker. · Continued chairing of the Western Sydney Economic Development Officers Forum. · Successfully merged with Marketing Task Group to form Business Growth and Marketing Task Group, and, after gaining expressions of interest from the local business community, held the first meeting for the task group in October, consisting of 17 task group members. · For the period over July to December, the PVEDC website has experienced over 20,900 visitors. New content has also been added to the website, and remaining content has been updated. · 2005 Penrith Valley Export and Business Survey conducted over three months, from September to November, and providing a comprehensive update of Penrith’s business and economic development profile, from the 2004 survey. Businesses in established industrial areas in the Penrith LGA, namely, North Penrith, South Penrith, St Marys, Emu Plains, Kingswood and Erskine Park, were surveyed with 1,528 businesses identified. · Presentation of 2005 survey results held at Penrith City Council, attended by Councillors, Federal and State Government representatives, local business people and media. · Strong media coverage resulting from the survey, with exposure in local and regional media. · New section on PVEDC website allowing visitors to download summary of survey results for both 2004 and 2005. · Further sponsorship support from local business community obtained for the redevelopment of the Penrith Valley Visitors Information Centre with over 50 sponsors of in-kind or cash contributions. · Construction of the custom-built centre commenced in October, although delays were experienced due to supply problems and weather, was only 4 days behind schedule by the close of business in December. · New section on PVEDC website for the Visitors Information Centre, providing weekly progress reports during its construction, photo gallery, sponsors acknowledgement page, and history of the centre. · Facilitated the World’s Biggest Kayak Cake, to support the 2005 ICF Canoe Slalom World Championships in September. On display for two weeks; donations from viewing the Kayak Cake were distributed to selected local charities. · Continued partnership with TAFE and Telstra Country-Wide to provide free e-commerce workshops to 400 local businesses. · Promoting skills and interests of Nepean High School students, who participated in the PVEDC’s Customer Service Program in early 2005, to local businesses to create local jobs, via PVEDC website. · Received responses by local businesses interested in students that had placed “mini resumes” on PVEDC website, with interviews scheduled for those students. · Facilitating and assisting the ‘Smart City Transport’ project, a unique initiative for a dedicated local transport information website, in conjunction with local business, Great Community Transport. The 2005 Penrith Valley Export and Business Survey was a project commissioned by the PVEDC’s International Business Task Group, and facilitated by the Corporation. The initial survey was undertaken in 2004 to profile businesses in Penrith Valley’s five industrial areas, including South Penrith, North Penrith, St Marys, Emu Plains and Kingswood. The survey identified the number of exporters, importers, export capable businesses, Information Technology uptake rate, the size of employment and number of employees, skills shortages, and advantages and disadvantages in each industrial area. Over three months, September to November in 2005, a follow-up survey was undertaken to all businesses in Penrith Valley’s five industrial areas, and was extended to include the developing Erskine Park Employment Area. The primary objectives of the 2005 survey were to identify new businesses, exporters and importers, track any changes or trends from the data of the 2004 survey, and provide a comprehensive database of potential exporters and businesses in the local government area. Results and recommendations from the 2005 survey were launched at a presentation in November, which was attended by representatives from various government bodies, Penrith City Council staff, the local business community, media representatives, and a summary of survey results was distributed. Information from the report has been made available to the Penrith City Council officers to support the planning and implementation of the Council’s programs. The financial cost of the project was $8,983, with staff contributing an average of 19% of time to the project. The Penrith Valley Visitors Information Centre has been providing information to locals and visitors from a temporary timber framed cottage in the Panthers World of Entertainment car park, since August 1990. In 2004, the Penrith Valley Economic Development Corporation’s Tourism Task Group, comprised of local business and tourism operators, moved to submit a proposal to redevelop the Centre and replace the temporary building with a customised Log Home building. A Development Application was submitted to the Council and was approved on 12 July 2005. The new building is being constructed and fitted out by in-kind and monetary sponsorships from Penrith businesses valued at well over $200,000 and a contribution from Penrith City Council of $89,600. The new Visitors Information Centre is being located next to the current building, which will be removed once construction and fittings have been completed. The area for the new Centre will be 145 square metres, up from the existing building’s current 75 square metres, and will include space for displays, a staff office, public and staff toilets, and storage. Construction of the new Centre commenced in October 2005, and at the date of writing this report, the structural work is complete, and roofing has been installed. The new Centre is in its final stages for lock up, after which, work will commence on the interior during January/February 2006. The project currently has 50 sponsors for the new centre. This equates to $167,650 received of in-kind support from the business community, and a cash contribution of $18,480 from the tourism industry. With Penrith City Council’s contribution of $89,600 this equals a total of $275,730. Staff have spent an average of 18% of time on the project. The World’s Biggest Kayak Cake was a unique initiative by the PVEDC to support the 2005 Canoe Slalom World Championships in September/October 2005. Open for display to the public from September 21 to October 1 within a marquee located in the Penrith City Council foyer, the Kayak Cake was baked over 5 weeks by the Western Sydney Institute of TAFE, and then carved by international ice sculptor, Kenji Ogawa, and decorated by members of the Golden West branch of the Cake Decorators Guild of NSW over 2 days. In total, 34 businesses and organisations sponsored the cake, with 13 being in-kind sponsorship, and 21 being cash sponsorship, to the value of $3,465 (incl.GST). Around 2,350 fliers were distributed to local businesses and centres across Penrith Valley. Fliers were also distributed during the Penrith City Festival on Saturday October 1 (last day of cake display) and emailed to the PVEDC database members and other associations for forwarding to their members. The cake was well received by the local papers, such as Penrith Press, Penrith City Star, and St Marys Star, with six articles being published before and during the display, and making the front cover story on the Penrith Press paper. A press release for the cake was also picked up by ARN (Mix 106.5FM, WSFM, 96.1FM) for their community ‘what’s on’ promotion, and for airtime by radio announcers. During the display, t-shirts, calendars and Championship tickets were for sale, with proceeds from calendar sales going to six designated local charities, including Westcare, Mamre Homestead, Great Community Transport, OZWAC, Nepean Medical Research Foundation, and the Brian Spurrett Foundation. A number of Tourism Task Group members, sponsoring businesses, designated charities and general community/business people volunteered their time to man the stand during the 2 week display. Time spent on the project by staff averaged 11%, with costs incurred amounting to $2,765. Major developments on the PVEDC website from the period of July to December, 2005, include the 2005 Export and Business Survey summary results, and the Visitors Information Centre “mini” website. Following the presentation of the 2005 Export and Business Survey results, a media release was distributed to attendees at the presentation, and also to media contacts on the PVEDC database, to promote a new section on the PVEDC website (http://www.pvedc.com.au/bus_task/export_survey.html) which contained an overview of the survey, and links to download PDF versions of both the 2005 and 2004 Survey Summary Results. Local businesses on the PVEDC database were also made aware of the link through a weekly story published on the website, and via media coverage. With a number of local business and tourist operators sponsoring the Visitors Information Centre, a “mini” website was developed on the PVEDC website, which would provide up-to-date information on the progress of the building. The Visitors Information Centre website features a weekly progress report page, photo gallery (also updated weekly), sponsors’ acknowledgement page, and a history of the centre. This site is also accessible to other visitors to the site through a bright logo link on the PVEDC menu bar. During July/August, static content was updated, including Task Group Achievements, Living in Penrith section, Business Environment section, and the Objectives and Aims of the Corporation. From the period of June 2005 to December 2005, the PVEDC website received 20,904 visitors, totalling 392,897 hits. The number of visitations to the website has grown in comparison with the first half of the year, from January 2005 to June 2005, which experienced 18,965 visits during that period. The average number of visits per day from July to December 2005, was 113, rising from an average of 110 visitors per day over the period of January to June 2005. Visits to the website have come from internet users in Australia, USA, New Zealand, United Kingdom, Germany, Canada, Finland, Japan and Colombia. The average time spent by staff on the website was 16%. There has been a cost of $3,652 spent on the website over the past six months. This has included monies for the building of the mini-website for the new Visitors information Centre, broadband, hosting and management of the site. Since January 2005, the PVEDC has featured in 114 media articles, which equates to just over 9 articles a month. This figure, however, does not include media releases or articles which have been published from sources outside the Penrith Valley area. The majority of media articles that were published have been a result of stories published on the PVEDC website, or media releases provided by the PVEDC. From July to December 2005, the majority of articles published by the media involved the World’s Biggest kayak Cake, redevelopment of the Visitors Information Centre, and the 2005 Export and Business Survey. That the information contained in the report on the Six Monthly Performance Report from the Penrith Valley Economic Development Corporation be received.